On May 5, 2015, the Santa Barbara City Council declared a Stage Three Drought Condition in response to the driest consecutive four years on record. The Stage Three Drought Condition requires a 25% Citywide reduction in overall water use, with mandatory regulations on specific water use applications. These regulations apply to all customers using City of Santa Barbara water. We want to make sure all our owners & tenants are aware of the new water restrictions and regulations. • Hoses must be equipped with an automatic shut-off nozzle when in use. • Irrigation with potable water is prohibited between the hours of 8:00 a.m. and 6:00 p.m. for automatic systems. If manually operated, such irrigation is prohibited between the hours of 10:30 a.m. and 4:00 p.m.
• Irrigation with potable water that causes runoff onto adjacent property, non-irrigated areas, private and public walkways, roadways, parking lots, or parking structures is prohibited. • Any excessive, unnecessary or unwarranted use of water is prohibited. All leaks must be repaired as soon as reasonably possible. • Irrigation during and within 48 hours after measurable rainfall is prohibited. • Washing of pavement and other hard surfaces is generally prohibited, with a few exceptions such as for health and safety purposes. • Vehicles and boats must be washed with a hose equipped with a shut-off nozzle or washed at commercial facilities that recycle the water. • The use of potable water in all non-recirculating ornamental water features and fountains is prohibited. Recirculating fountains with a water surface area greater than 25 square feet are prohibited unless located indoors, on residential property, or are home to aquatic life. • Pools and spas must be equipped with a cover when not in use. No draining or refilling of pools by more than one third, unless authorized. Pool cover rebates available. • Drought notices are required in restaurants and other eating and drinking establishments; water served on request only. • Hotels and motels must post a drought notice in each guest room and provide guests with the option of choosing not to have towels and linens laundered daily. • Gyms, pools, and other businesses providing showers must post drought notices and promote limitation of shower use. For more information on regulations and exceptions, click here. The best way to reduce water usage by 25% or more is to evaluate landscape water use and check for leaks. The City’s Water Conservation Program is here to help everyone save water; for assistance evaluating water use and conservation opportunities, receive a free water checkup. To schedule, call (805) 564-5460. Here are some changes that will be great news for Santa Barbara owners that accept Section 8 Vouchers through the Housing Authority of the City of SB. They are doing a great job trying to work with property owners and landlords, and are making changes to their policies that will make their clients more appealing as potential renters. · Section 8 Unit Damage Protection NEW! – reimbursement to the owner of up to $2,000.00 for unpaid unit damages, rent, and related court costs in excess of the tenant’s security deposit. The amount of this payment will be calculated using the higher of the actual security deposit amount paid -or- the equivalent of one month’s contract rent (if the owner has collected a security deposit of less than one month’s contract rent). · No-limit rent increases NEW! – rent increases will not be limited to a maximum amount as long as the rent increase is based on rental market data and is considered rent reasonable (equal to non-subsidized housing rents in comparable units). A Public Hearing was scheduled for June 11, 2013 by the City Council to discuss the details of proposed utility rate changes. A 4 percent across the board rate increase was proposed for wastewater rates to offset the increasing costs of maintaining, operating, and rehabilitating the wastewater system. Trash and recycling rates reflect changes due to implementation of a new contract with the City’s hauler, Marborg Industries. All rate changes, will take effect on utility bills dated July 1, 2013 or later. During a drought, the City relies on its customers to preserve remaining water supplies through extraordinary water conservation. At the same time, the City faces increased costs to maintain essential water service, including more expensive capital and operating costs to increase drought water supplies from groundwater and water purchases. The City is proposing drought water rates to provide a portion of the revenue needed for the City’s cost of water service, and to encourage extraordinary water conservation to ensure the City maintains sufficient drinking water supplies for its customers. You can see the proposed rate changes on our Water Rate Changes webpage. (Applicable only to customers billed by the City for sewer service). The proposed wastewater rate change is a 5.5% percent increase to the City’s current charges for all customer classes. The maximum monthly charge for a single family residential customer would increase by $2.22 under the proposed rates. The proposed increase will fund operating costs, as well as replacement and repair of the City’s aging sewer system. This includes replacement of critical facilities at the wastewater treatment plant. The City will expand the number of non-residential customer classifications during FY 2015. All non-residential accounts will have the same 5.5% rate increase during FY 2015 as for residential accounts. (Applicable only to customers billed by the City for trash/recycling collection). b) increases to the “tipping fees” charged by the processing and/or disposal sites that receive City waste. The City is contractually obligated to compensate its franchised waste hauler for these increases; as well as a new fee of 0.7% to fund the long-term repair and replacement of the City’s public trash and recycling containers. In addition to the 1.6% increase described above, rates for Multi-Unit Residential carts and cans will increase by 2%, and Multi Unit dumpsters will decrease by 2%. These adjustments are part of the City’s long term plan to bring Multi-Unit dumpster and cart/can rates to an equivalent price per gallon regardless of the type of container serviced. The impact of this change on actual bills will vary depending upon each Multi-Unit Residential customer’s specific mix of cars/carts and dumpster service. Find more information on water & sewer rates online on this link. You can also find more information regarding trash & recycling rates at this link. Questions regarding water and sewer rates can be directed to (805) 564-5460. For questions on solid waste rates and recycling, please call (805) 564-5631. A Stage Two Drought was declared by the Santa Barbara City Council today, May 20, 2014. The City is requiring a 20% reduction in water usage from our community to help reduce the projected water supply shortage. 50% of our water used in the City is for landscaping. Customers watering their landscaping are encouraged to reduce water usage by more than 20%. Santa Barbara is experiencing an unprecedented drought, with the driest consecutive three years on record. Currently, City water supplies are severely reduced in capacity with Lake Cachuma at 37% and the State Water Project deliveries are projected at 5%. We have no water to waste. The best way to reduce water usage now is by evaluating landscape watering and checking for leaks inside and out. The City’s Water Conservation Program is available to help everyone save water. For help evaluating water use and conservation opportunities, call 564-5460 to schedule a free water checkup. On Tuesday, June 10th at 2:00 PM, the City Council will hold a public hearing regarding proposed increases to water, wastewater (sewer), and solid waste collection rates charged by the City. Increased rates would be effective on monthly utility bills dated July 1, 2014 or later, effective for water usage as early as June 1, 2014. 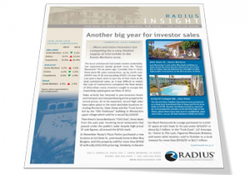 Every year for the last 6 years, Radius Group hosts the annual Real Estate & Economic Forecast. Based on their 2013 Year End report, the residential & commercial real estate markets in Santa Barbara and the Ventura counties has experienced steady growth.